The Michi-no Eki is 2½ hours drive north from Naha on Highway 58. 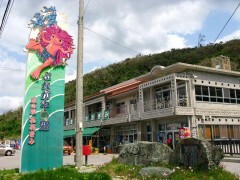 Ogimi village, where the Michi-no Eki located, is in Yambaru, as the north regions of Okinawa are called, and is a small village with a population of 3,400. Ogimi has scenic mountains, deep forest, rich nature and original Okinawan landscape such as old folk houses with red tiles. Moreover, Ogimi is also noted for the longevity of its people, thus their traditional and healthy diet with natural bounty has been getting wide attention. Ogimi has several sightseeing spots for nature-based experiences including Nana Taki, a waterfall, Shioyafuji, a mountain, and Shioya bay that has a beautiful contrast between hills and the sea. The birth of Michi-no Eki Ogimi was 1999, and it has been administered as a rest spot for visitors coming to Yambaru. 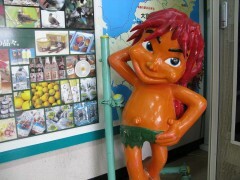 Currently, there are a farm stand and two different restaurants that link to Ogimi’s local products. The landmark to find the road station is a big Bunagaya sign. Bunagaya is a kind of spirit that loves peace and nature living in Okinawa since very early times. Ogimi has chosen the spirit for the village character, so the Bunagaya signs can be seen all over the village.